Răsvan Popescu was elected as president of the Council in 2007, a decision that was confirmed by the Romanian Parliament. 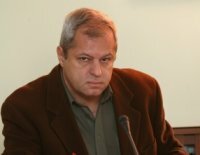 Before joining the council in 2000, Răsvan Popescu worked as a journalist, chief editor of Romanian Television (TVR) and a spokesperson for the former Romanian Government and President. His formal training includes a Masters in Journalism from California State University and a degree in Geology from Bucharest University. He has published six books and six film scripts. Before 1990; geology engineer on the mining sites in Valea Jiului and Valea Prahovei. 1990: columnist for “Express” weekly newspaper with Cornel Nistorescu, editor-in-chief. 1997-1998: in charge of the Information Department of the National Television; coordinated “Special Edition” TV program. 1998-1999: State Secretary, head of the Public Information Department and Spokesman for the Government. 1999-2000: State Counselor, Spokesman for the President of Romania. “Too Late”: directed and co-written by Lucian Pintilie; shortlisted for 1997 Cannes Film Festival. “Paradise Terminus” , written in cooperation with Radu Aldulescu; directed by Lucian Pintilie; awarded the Special Jury Prize at the 1999 Venice International Film Festival. “The Famous Paparazzo”, a screening of the novel “The Man With Beak And Claws” directed by Nicolae Margineanu. In 1999 he film was shown in Bucharest and in other eight major cities in Romania. „Dream woman”, (2005), feature film directed by Dan Piţa. UCIN awarded it the prize for image and screenplay. The director was awarded with UCIN prize for cinematographic creation. „Something good out of this life” (2012), directed by Dan Piţa. Prize for the best film and Prize for acting in the Avancs International Film Festival (Portugal), UCIN Romania prizes for image and acting. He was decorated by Steaua României, Moldova Cross and several other foreign medals and orders.